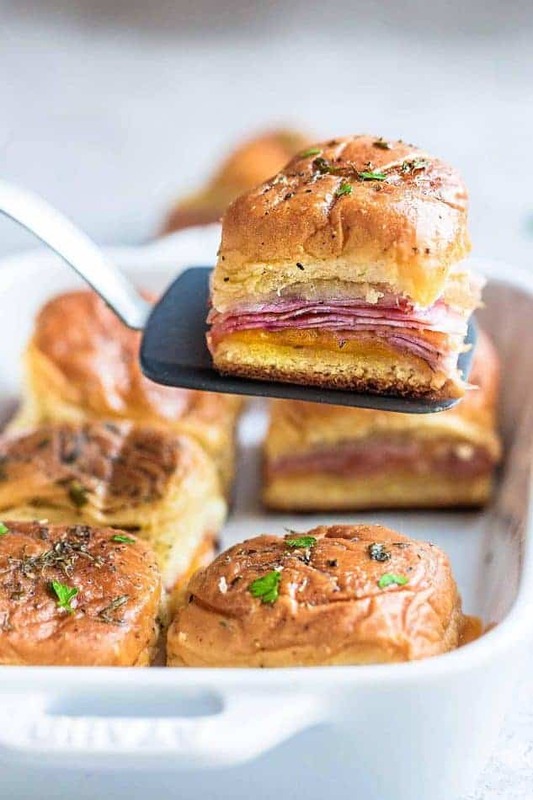 Ham and Cheese Sliders – perfect game day snacks and a great way for using up any leftover ham. 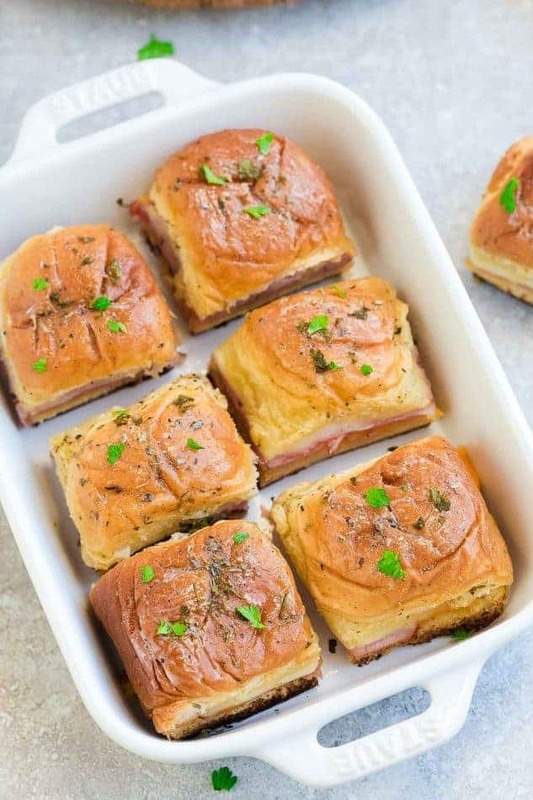 Best of all, super easy to make with oven roasted ham, two cheeses and buttery garlic sauce over Hawaiian rolls. Plus recipe video. With holiday entertaining seasoning in full swing, easy and simple recipes are a must around here. And you guys! 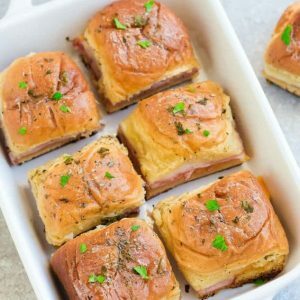 These tasty bite-sized Ham and Cheese Sliders could not be more simple! They’re hot, gooey and are just perfect for using up any leftover ham (or you can even use turkey) from Thanksgiving, Christmas or Easter. Plus, I love serving Hawaiian Chicken Sliders, Chicken Bruschetta Sliders or these Mediterranean Chicken Sliders when we’re feeding a crowd on a big game day (or Super Bowl) since they always disappear so quickly. 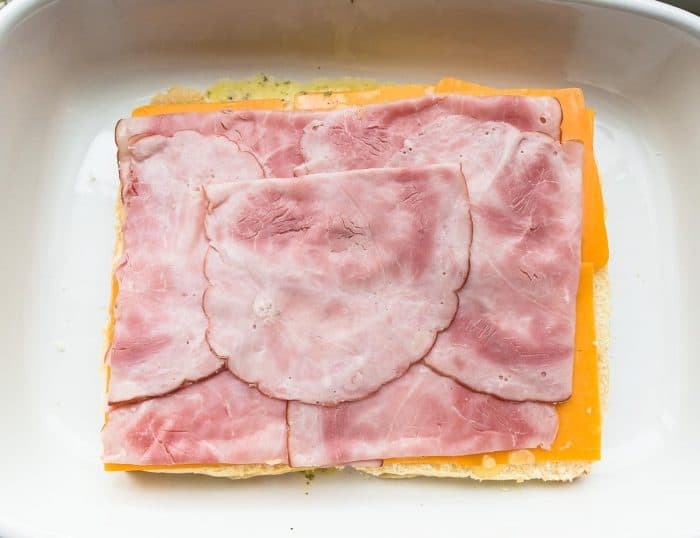 If you’re thinking that these are your classic ham and cheese sandwich, you couldn’t be more wrong. They have two-kinds of cheeses and are loaded with flavor. You start off by placing the slider buns on the bottom of a 9 x 13 greased casserole dish. I used these soft Hawaiian rolls because they are a favorite but you can use any rolls you like or have on hand. 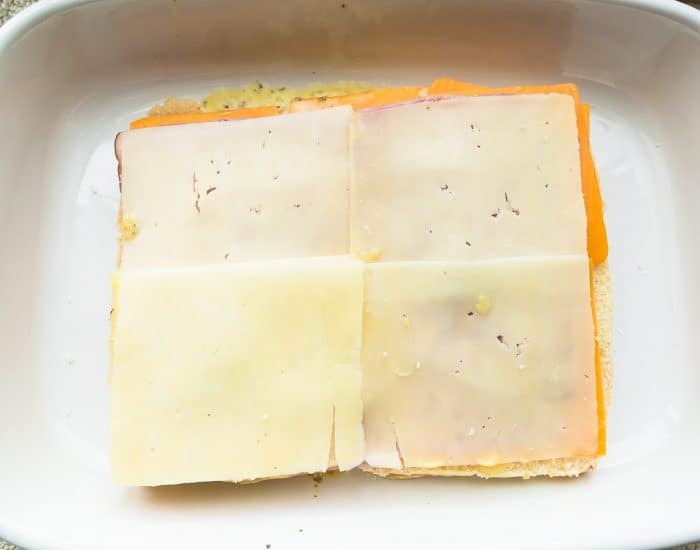 Spread some butter, a layer of cheddar cheese, some honey ham, and top with a layer of Swiss Cheese. Place the top buns in on top and brush on some melted garlic butter mixed with some Italian seasoning. The buttery topping seeps into the bread as it cooks and adds the most unbelievable flavor. You’re going to bake these delicious sliders in the oven until those fluffy rolls are lightly toasted and the cheese is ooey gooey. WHAT OTHER FLAVORS CAN I ADD TO THESE HAM AND CHEESE SLIDERS? To change things up for the next weekend, you can add a little bit of Dijon mustard, poppy seeds or sesame seeds. WHAT IF I DON’T HAVE HAWAIIAN ROLLS? 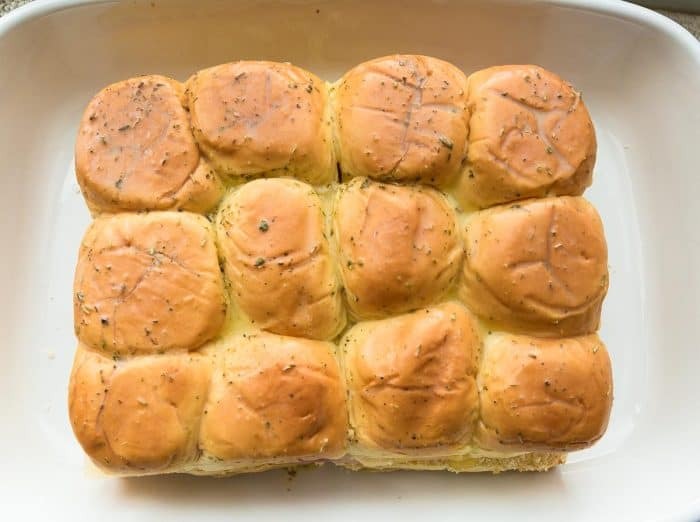 You can use also use any other soft dinner rolls or mini burger rolls you have. The best part is, these sliders are super easy to make, and they definitely don’t stick around for very long. These babies would also make a great addition to summer parties, potlucks, and get-togethers. I know my family would love a batch of these for a weeknight dinner or as an after-school snack. 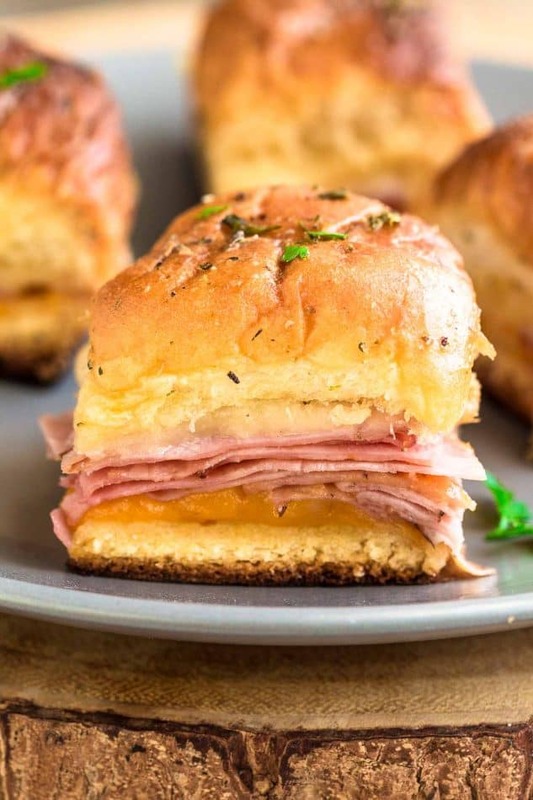 Ham and Cheese Sliders - perfect game day snacks and a great way for using up any leftover ham. 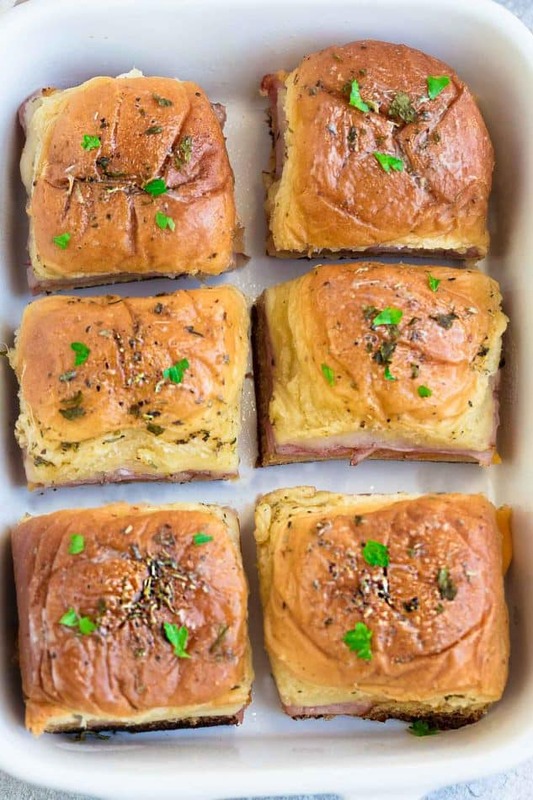 Best of all, super easy to make with oven roasted ham, two kinds of cheese and buttery garlic sauce over Hawaiian rolls. Plus recipe video. It’s a good recipe you can change and it’s still great (different meats or cheeses). can’t wait to try this for my 9 year old ham lover, thanks!! MY precious granddaughter absolutely loves these, but I sprinkle MOZARELLA on hers instead of garlic mixture. Love these!! Making them right now as we speak but this time I’m adding bacon and tomatoes!! Yum!! Yum! We make these every weekend! I plan on making these for a CHRISTMAS LUNCHEON when I haVe some friends over. 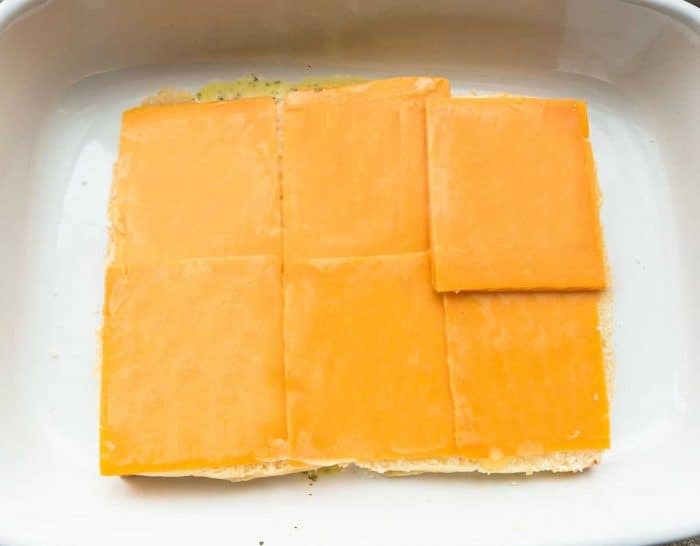 Only thing I will change is a diffeRent cheese besides cheddar which I cant stand, probaby Monterrey Jack.